I knew Wizard of Legend was something special when I first saw it. And I was sold on it from first sight. I really wanted to write music for it. I remember crossing my fingers as hard as I could at that time. I was going around wincing and people would ask me what's wrong. "Dale, are you okay?" And I'd snap out of it for a second: "Oh, what? Oh...yeah, I'm fine." Eventually the developers had me write a piece and they really seemed to like it -- they bought it -- but I didn't know if I had the full job for a bit. And when they finally told me I was on board I was over the moon. I really wanted that excitement and energy to carry into my work and I did my best to make sure that it did for the year or so I worked on the soundtrack. Contingent99 had a lot of Wizard of Legend's look and play style in place before they hired me to write the soundtrack. I suppose that this worked in my favor as I had a really firm idea of how I wanted it to sound before they gave me any direction. But just on first sight I was set on a direction. I mean, it just looked magical, even in static form. When I played an early build, seeing it in action cemented my feeling of how I'd approach the soundtrack. I somehow came up with the idea that I wanted something bright and fast, sometimes sparkly, sometimes searing to the ear, but I wanted the instrumentation to lean hard toward classic sample-based synthesizers, and that's mostly because I loved the Sega Saturn's soundtracks. Musically, I something with an edge at the fringes, but always with the core of being magical and heavily melodic. Something cool and bold, but with a nice, soft heart. But as anyone that makes music for hire can tell you, you rarely get what you want. When I started on this, near the middle of 2016, I had come off a stretch of game work where the client was firmly set on how the game would sound and feel, and "retro" was certainly the flavor of the season, if you will. I was an order cook at a diner but wanting to play chef for a bit. And while I'm totally, fully fine with writing a retro soundtrack my heart was set on doing something different. I was hoping that Contingent99 would be open to something pretty different from what you'd expect to hear if you saw this game...and I was pleased to find that they were. They were very supportive of the sound I had in mind and they worked with me along the way to help make it fit and make sense for the game's world and characters. Information and inspiration continually came in and music continually came out. They were endlessly encouraging of my work, and that fueled the creation of the soundtrack, song by song. It was a collaborative and truly fantastic process. Actually, they deserve even more credit in the music making process. While both members of Contingent99 were very open to the sound and direction I wanted to take the music, they had strong feelings in how the final piece should fit into the game. From the very beginning I had a sense of how much they cared about Wizard of Legend, and not just the look and sound, but also the feel and the cohesiveness of it all. And for me that meant a lot of revisions! It was hard to go back to a song that many times (as you'll see in the Composer's Commentary) but it was their detailed feedback, clear guidance, and everlasting patience that made these songs fit so well. They would always insist that they had little knowledge of musical or technical terms, but the guidance they gave ended up being very musical. I felt it made the songs better. I was very lucky to work with people that cared so much about the music! This is a track-by-track walkthrough of the entire Wizard of Legend soundtrack, and is intended to be read while listening. It covers the music creation process, and references my notes, drafts, Trello boards, conversations, and more. I hope this brings a bit more enjoyment to the soundtrack as well as gives a little peek into the game's development. This will lean more toward the music creation process but it won't be too technical. And some of the songs have some interesting stories behind them! Please pull up a copy of the album and listen/read along! Wizard of Legend's look and play style immediately took me back to the mid-1990s, back when the best controllers didn't have analog sticks and the cutscenes were fuzzy but you didn't complain. I adored the Sega Saturn and PlayStation and much of the draw for me was how soundtracks began opening up, thanks to the disc-based format. We weren't quite to the point of huge audio budgets and full orchestral scoring sessions for many games yet, but a lot of artistry and inspiration was being dumped into...well, everything! You could just hear composers stretching and relaxing musically, coming off the cartridge game era. They could use real instruments. They could multitrack and perform solos. They could go nuts! But they didn't so much. They just used synthesizers. They used Japanese synthesizers specifically. Presets from sample-based synths from Roland, Korg, Yamaha and others could be found in just about every soundtrack of the day. And it was a really nice fit with what was going on visually and creatively in games. Improved graphical fidelity and 3D just getting its foothold into games needed a musical component to match, and the bright, wide-panned, shiny, super punchy, and admittedly overdone sound of, say, the Korg Trinity, or the Roland JV/XV rack synths were a perfect fit. It was new (well, at least to games) and the shine and brightness caught the ear just as much as the bold colors and new graphics caught the eye. I fell in love with the sound back then and never fell out, and I suppose that's why my studio is packed full of the sample-based synthesizers of the day. Now 20 years old or more, with fading screens and failing buttons, these synths sound flat and fake compared to modern day music making tools. But they've become something of a trademark for me. I sneak one or two of them into every project, even if I could use something better. And I've been using them so long that I know their strengths and weaknesses, inside and out. So, with this game that gave me this wonderful feeling of one of my favorite eras of gaming both in look and play style, I wanted to at least somewhat pay tribute in the best way I knew how -- with my old, trusty gear. So old rompler (the nickname given to this kind of synthesizer) sounds were the core of the tracks. But given that it is also a modern game, and focuses heavily on fast, magical gameplay, I couldn't just have old romplers buzzing and chiming about alone. So I gave each synth-based song an orchestral robe to wear, if you will. The fast strings, fluttery woodwind runs, and back-hall glockenspiel and bells represented the magic, and the rhythmic tom work and staccato brass counterpoint would hold down the action and set the pace. To me, this formation would represent both the world and gameplay, and would also fit as the hero and enemies, and could be adjusted easily to work within each stage's needs. I was bummed that they wouldn't let me write this piece until late in the process, but even later on I made sure to hit it with a full dose of what I was hoping to instill from the beginning: sparkly, magical synthesizers that set the stage, and then big, fast melodic work to make the statement. But to get from there to here I wanted to sweep up into something exciting. 0:06 -- I filterswept (the oowaaaahh effect) the saw leads and pad I had created to rhythmically accent the melody later on, but I also subtly swept the orchestral stuff, including the brass and strings. It's a trick I used several other times in the soundtrack. I'm hooked on the effect now. 0:10 -- I didn't want a straightforward beat (here or anywhere else) because I'm a bit of a nonconformist, sure, but I also think it's more fun to have a melody that bounces around and leaves some mystery as to where it's going next. I tried to do this with all of the songs of the score to kind of point to the unexpected nature of enemy encounters and the random generation of the dungeons. 0:31 -- These clustery, ascending builds are used many times in the soundtrack. They're a musical representation of the game's ever climbing tension and challenge. 0:46 and others -- The tails of not only melodic lines and accompaniment, but even builds and runs often start organically but end with some kind of synth edge. It may sound simply layered, but I took great care for the effect so that it would start clean but end edgy and bright. This was done with simple super saw synth patches and filtering, and lots of nudging for timing. It sounds particularly cool in this build, I think. 0:49-0:56 -- In an attempt to keep things magical I wrote in countless ascending and descending woodwind and light synthesizer parts that layer and combine to make what you hear in the answer part of the question and answer phrases here. I do this throughout the soundtrack and in them I've hidden callbacks to the melody or counterpoint, other themes, and more. These are my musical easter eggs. The Museum theme every so slightly calls back to the trailer and home themes but you'd really, really have to want to hear it to recognize it. I restrained the full-on use of musical "magic" here because you're just learning about the game's lore and systems, and have yet to really feel full-on power in the game yet. I kept it simple save for some of the quiet solo woodwind lines you'll hear faintly in the background -- and they hint at the magic to come. I didn't want to write a bland, standard 'get ready' song for the plaza theme, but I also didn't want to go full-on into the magic formula I'd concocted for the dungeon themes just yet, so it took me some time to figure out what to do here. I ultimately decided on using rhythmic interplay -- something I originally decided I'd save for the dungeons. It worked out and was fun to do. 0:17 -- After a few bars of straight march-style beat I turn it around a bit with a figure that plays with the rhythm in a way that made me do a little dance when I recorded it. Notice the counterpoint in the back, the quiet staccato brass. 0:34 -- That counterpoint returns more fully here, but kind of switches places with what was the melody in the previous figure through switches in dynamics and instrumentation. 0:41 -- I originally had this rhythmic play and switching continuing on but I realized that that there also needed to be a kind of brave, proud element to the song. So I eventually replaced it with this B-section that features a more flowing melody and proud brass accents. But it soon calms and returns to the 'get ready' element. Previous version peek! Here's an early demo of the first plaza/hub theme, which was darker and less heroic. Some really cool synthesizer work too! I never finished it but it was getting pretty close. It just didn't fit the magical, upbeat feel of the game. This was the first song Contingent99 hired me to write after the trailer theme -- the first one for the game. And they maintain that it's their favorite! I want to tell myself that it was because I was confident in the sound and musical ideas I wanted to get across but the truth is that we had to reshape it a few times to really hit the points they wanted it to. But I got to keep my ideas and themes so I guess we're all happy with it. I wrote the ice theme to clips of gameplay. Seeing the movement and pacing helped me a lot. 0:01 -- I insisted that all songs have an intro and I wanted it to feel like magic was setting the stage in all of the level songs in them. This one was an ice stage so I worked up the iciest sounds I could to set the color of the track. Instrument manufacturer Korg has always built their synthesizers with clean, clear converters that have always outputted a higher sample rate, even before high sample rates were cool in music production. Their old flagships have a shine that even some modern day units can't touch. So I went to them first for clean, sparkly, rhythmic bell tones that would not only set the stage but also carry on as accompaniment through the track. 0:08-0:12 -- I morphed (crossfade and filter) a sampled choir into a synth pad for no good reason. 0:12 -- For the whole score I have this super agile, super loud, sometimes impossible to play cello returning to carry the melody and set the themes. It's not the lead instrument of the score, but a recurring theme -- like, oh, there's that impossible cello again. 0:15 -- These staccato string stabs and saw synth chords are just piles of notes that provide color and rhythmic accent but I had the best time playing them. 0:26 -- I was certain that the developers weren't going to be cool with funky synth bass as a foundation for all of these songs so you'll notice that in every one of them this element drops in over time, usually later. And it'll drop out and key moments and come back in. The little rips and turnarounds (see 0:32) are a joy to perform and I often laughed at myself while tracking them. I originally tried to sneak them in but eventually gave in to being bold with them. 0:42-1:10 Though it starts off with quiet flute lead and ends up with huge strings you'll hear that weird cello weaving its way in and out. I wanted to keep it mixed in but never playing the same thing. 1:11 -- Every dungeon song has a bit of a calmer breakdown that tones down the instrumental onslaught and plays with rhythm a bit, again a nod to the random nature of the dungeons. The developers liked how this played into their idea of starts and stops, ramps up and ramps down. 1:30 -- Tom fills that trip over themselves and spill over were a stylistic thing I chose with this song and continued through the whole soundtrack. 1:40 -- One of my trademarks: a long, suspended "huh?" chord. They're usually a point of contention between my clients and myself. 1:48 -- We're back to the main theme, and not necessarily loud and full yet. But there are hints of super detailed runs and fills, and the bass line picks up considerably as a sort of preview of the climax. 2:13 -- Every song has a short high tension section that, through the nature of looping game music, shows up randomly while playing. When the fates decide to line up this section with high-action battling with tons of enemies and on-screen spell effects it feels great. Revision notes: Two revisions total. This third version was more sinister and less poppy than the original. Less funky and more dark. Previous version peek! Here is a demo from the first version. It was way too laid back and synth solo-y, but I still think it's a good song. You can definitely here that I kept some ideas and rhythmic patterns. I think this is a nice listen but it doesn't sound like Wizard of Legend at all now. I especially love the building section starting at 1:12 and how it continues to 1:42 with a soft string release. Enjoy! We took conference calls for each of the dungeon tracks separately over the course of the work. I really appreciated the attention they were willing to give to the music. But, in looking back (this was written in early 2017), I recall our call on the earth theme and these exact words from them: "We don't know what we're looking for." Which is usually a nightmare for a composer. But in talking to them they clearly didn't want something primal or cliched, which I was pleased to hear. Words like "spring" and "mysterious" and "nature" soon came up. Dark and old, they said. Maybe some piano. So, magical fighting in a place that is old and with history, and covered with overgrowth. I had it. Here's a peek at an early version of the earth theme session. 0:01 -- I wanted the intro to sound like something was growing, but dark. 0:06 -- Here's our cello again. Too fast and agile, but it hands off to brass a bit. I wanted agility set against constantly springing background (growth) that would be clear and defined, but also dark. Cello to the rescue. 0:17 -- The backbeat is irregular, as described in previous songs, but continually grows. Here it adds a few more elements but makes allowances for some rhythm play in the brass. As this song first came to me in my head I honestly wasn't sure how to count it. 0:30 -- As with the ice theme, here's a break that plays more with rhythm than with volume, to mix things up and keep ears tuned in. I selfishly wanted to turn things down so that listeners would hear the super intricate percolating backing, which consists of woodwinds and synth lines. 0:50 -- We come back to the theme with support from the brass and more piano support. The melody also becomes embellished a bit to bring the listener further in. And the rhythm continues to add elements slowly. 1:04 -- These accent notes help break up the smooth, fast lines and hopefully add some energy and tension. 1:15 -- More morphing synths into real samples and vice versa. The famed Korg M1 garbled looping samples makes a quiet appearance in the background out of the right channel. 1:18 -- I wanted the cello to move between agile, smooth melodic bits and hard accents, which was supposed to relate to moving from room to room in a dungeon and encountering enemies. I really liked how it came out. 1:31 -- No arpeggiators -- I hand programmed all of these percolating and bouncing elements. At a slow tempo. But, sped back up and layered in, they did the trick. This is very fun to do. 1:55 -- In line with the ice theme's song structure, the earth theme comes back to the main theme once more, with emphasis. A horn counterpart comes in and weaves throughout on its own, but lines up on the accents. And those synth parts that drive the whole song morph to fit the rhythmic accents -- which is another good reason to not just use an arppegiator! 2:11 -- Our accent notes come back with more energy! And then give way to super energetic strings with plenty of 32nd notes for the climax. Previous revision peek! This demo shows the earth theme really early on when I had an idea for a winding, semi-peaceful melody over a beat. It was probably too intricate and didn't flow enough. But you can hear that I kept some of it and all of the rhythmic backing ideas. I was really attached to where I was going at 0:55 too. And 1:09 was kept and built upon in the final version. Funny story: when you listen to this song I want you to think anger. I'm not an angry person at all. But some of that slipped in as I rewrote this song many times. And that's my fault -- I wasn't getting what they were trying to get across. But I nailed it in the last version and you can hear that in every part. Going in for the last time I said to myself that I was going to write the hell out of this song so that they couldn't reject it again. And they didn't! Tons of determination and strong energy went into this song now it's my favorite on the soundtrack. A Trello update (one of many) that had me keeping track of all of the revision notes. 0:01 -- I opted for no intro -- in my mind everything was already on fire. Big drums but irregular, syncopated beats is what I had in mind but I kept missing on how that would sound. But I got it right this last time. 0:11 -- That build isn't a cluster -- it's a deliberate chord with intentional voicings that are used throughout the song. It's the only intro-minded work I did here. 0:13 -- Spiccato strings work in tandem with the drums to build a groove. While it may be irregular I made sure to work it out so that a rhythmic bass line would fit in there somewhere too. 0:18 -- This piece is peppered with irregular woodwind solos. These are musical representations of my stress! I used a wind controller to play these manually. Actually, I play all my woodwind parts in all of my music manually with a wind controller. The build at 0:25 is probably a better example. Each instrument is played individually, freely, and rarely with any corrections via MIDI. 0:27 -- I still laugh when I hear the melody come in because I wrote it through gritted teeth, humming it to myself as I was adding revision notes to my Trello board I used to track my progress on this project. When you hear the growling low brass (I layered in some pretty raw saw wave synth lines for edge) playing this you can almost picture me humming it. 0:33 -- My odd preference to not use straightforward rhythms and patterns shows up here at 0:33 in the melody. I wrote around the irregular rhythm with the brass but wanted some interplay so I could highlight the woodwinds and this is what I came up with. Here you can clearly hear the super saw synth line helping the brass, and I had a filter just gradually opening up throughout the phrase, closing again for the next one. 0:44 -- My trademark 'huh?' held chord thing comes back here, but now in the melody! But it tapers (closed filter trick!) and leads into the end of the section where woodwinds double the strings for a kind of tense but light part. 0:54 -- Everything's on fire but you're running right through it fighting. That's the musical idea here. And I got that from early gameplay footage the developer's sent me. Long notes contrast with the super fast backing, synth, bass, and woodwinds nicely here. 1:08 -- An instrumental hand off not unlike what I did in the other dungeon themes, but this time to make it feel a bit more brave and bold, like something withstanding the fire. 1:17 -- This build into the next section came directly from my angry humming session. 1:21 -- Rhythm play and syncopation section again, but I kept it really light (as light as I could for a fire dungeon theme) so that all of the complex layers of my rhythm and synth backing would show through for a little bit. 1:29 -- I hope someone out there is mad about this orchestra-wide grace note. It's not realistic, they'll cry. 1:33 -- This rhythmic section uses more and more instruments and introduces a trumpet as a secondary lyrical element. And unexpected accents help mix things up. 1:48 -- I wanted to take a quick second to make things grand and flow-y for a bit, using the strings to kind of tie this song into the rest of the soundtrack. So they play a new melody for this short section. The brass continues on but the melody is modified and softened for these couple of bars. 2:00 -- That trumpet from 1:33 was a preview of the climax. It comes in with the new strings and the already established rhythm and brass to make a mega section that brought my music workstations to their knees at this tempo. The build at 2:12 would crash my main computer on anything outside of the biggest memory buffer settings! Revision notes: SO MANY. The first song was too synthesizer heavy for the developer's taste. And honestly too ambient for my tastes. The next couple of songs were too percussion focused. I really was attached to the rhythmic work I did in these -- I had patterns that felt almost half-time but immediately felt double with the addition of some elements. I went nuts with the bass lines in the latest version and I was so disappointed that it wasn't used. I've included the best version prior to the final rewrite. Previous revision peek! You are hearing version 2 of the fire theme here which was quite different, though it had a lot of the same thematic ideas here. I really had fun doing the super funky bass line and the syncopated rhythm work. I'm not going to talk too much about this stage because...well, you can guess why. But I can talk about the music! I'll add more details later on. 0:01 -- Synth arps and a light organ (as to not hog the frequency range) kick it off and set the stage as airy, and drums coming in ground the piece rhythmically. Again, I avoid straightforward beats (personal taste) and try to mix it up a bit, carving holes in the rhythm and accompaniment for future additions. 0:16 -- Choir. Unabashed use here mostly because it fit the theme and sonically laid nicely against the synths and organ. I mean, how many chances do you get to have someone pay you for super epic, high BPM game music? I seized the opportunity. 0:18 -- The build pattern and voicing calls on another song or two in this soundtrack. Let's see if you can guess. Everything else builds too. The filter opens up on the bass and the fills get ridiculous in a very temporary build. 0:23 -- This being an air theme, I wanted something light and agile but the cello didn't feel right here. Violins do the job for a bit and then they hand it off to fuller voices. You'll also hear the filter on the bass part opening and closing with the phrases. I assigned the control to a foot pedal here so I could use both hands to keep the bass active and rhythmic. 0:34 -- Tons of subtle woodwind work starts here beginning with a chromatic piccolo run that carries through the transition into the next section. Solo instruments continue in a question-and-answer format before defending at 0:39 and then tying into the main melody for a bit. 0:48 -- In keeping with the structure of the other dungeon songs we have a rhythmic interplay section here too. I never do the flowing harp thing but here it felt really good and fit with the air theme. 0:55 -- Were you looking for the 'huh?' chord in this one? Here it is. And to accent just how weird it is I decided to turn the beat over and go nuts with the bass part. 1:01 -- Just as much as I don't like straightforward rhythmic backing I also try to avoid straightforward melodic movement. So while this phrase starts the same as the last, I wanted to do something fun and far-reaching melodically for the rest of it. I like how this turned out: it's dynamic and kind of flashy but it felt like something that played into the air theme as well. 1:10 -- The B section establishes a secondary melody that will act as counterpoint in the end. Crazy cello shows up too. 1:28 -- This build is massive but it isn't even the final one! And you might recognize the figure hinted at in the intro section here, just way bigger. 1:33 -- This is kind of a blend of a new section and some old parts where I mix around some of the elements of the themes in a fun way. That one conga carries so much of the syncopation weight and if you mute this track it changes the feel completely! 1:48 -- Only high, clean chime washes and synth parts could stand out over this sonic mountain. I left a lot of space so that things could shine through, like these D-50 pads and Triton bell tones. 1:56 -- When I wrote this ending -- a little nod to Japanese jazz fusion that I love so much -- I just knew it would be rejected. I mean, it even changes the time signature and would get in the way of a seamless loop. But they liked it! I did a cool run up with some of the more synthy elements (along with the help from our cello friend) and then created a ridiculous reverb tail that was timed exactly so that it would run seamlessly into the loop without being apparent from the start. Revision notes: First version accepted! Well, save for a small bass part that got too funky. They had me cut that. According to streams and purchases and feedback and just my general feeling, this is the soundtrack's most popular track. And I'm happy to hear that as I thought people would feel that it's too over-the-top. But I thought it would be a good break from the high tempo, epic soundscape I set for the dungeons. I had fun with this somewhat rearranged version of something I was originally going to call the main theme for Wizard of Legend. In a way it still is a primary theme. I wanted it to breathe and feel alive musically, which sort of points to the animated nature of the objects in your home in the game. 0:01 -- Starting a loop with a pickup note? For shame! 0:05 -- One of my peculiar preferences with pizzicato strings is that I don't want the natural buzz of the low end contrabass plucks in there, especially when exposed. So I usually equalize or mix it out, or like in this case, layer it with cheap old 1990s rompler pizzicato sounds. 0:18 -- There's our friend. 0:22 -- The strings breathe here as much as I could make them in the short length of the phrase, again, to kind of relate to the talking inanimate objects in this room in the game. 0:35 -- Light, freely played piano never takes the spotlight but accents everything in the song. It's really just a dressed up piano piece with tons of embellishments. 0:40 -- This octave jump down and then staccato eighth notes figure is used in a lot of the songs of this soundtrack! And several times in this song. 0:57 -- Cello friend takes us into a transition where the above mentioned figure does the rest. The idea here was for some warmth (home theme!) in with the whimsical feelings. 1:28 -- The fast solo woodwinds show back up but I toned it down here as this song is more open and revealed. 1:38 -- Another trademark of mine you won't hear a lot in this soundtrack: a piano 'dig' chord. I'm a classically trained pianist but growing up I had access to a Fender Rhodes for practice and I loved to make it growl. That carried over into my piano playing and now into my writing. A lot of times it's uncalled for and way too much. Maybe it is here too. 1:47 -- This section is very sweet and I wanted to make the listener feel attached to home through this, musically. Originally it was also very warm and full but I might have overdone it and took it into the range of romantic. The developers asked me to pull it back a bit and what's left also seems to do the trick. The boss battles are fast and brutal in Wizard of Legend so I wanted to write something that matched that energy and speed. So, high tempo and lots of flashy synths and dynamic strings. Luckily, getting this right is easier than the game's boss battles are! 0:01 -- A big synth wash with a lot of my gear firing simultaneously was the intro. I used both internal synth filters and external ones to get this exciting, sparkling sound -- even if it is just a held chord with minimal motion. 0:03 -- I still resist here on a regular, straightforward beat. It's a cross between being a nonconformist, a music nerd, and someone that a bit of complexity in what I listen to. I trick a bit with a naked section snare hitting on beats two and four, but when you hear the syncopation in the synth work it's hard to feel like this is a straight beat. And then the melody of the rhythm comes in! 0:09 -- The held notes of the melody fall back to give a descending pattern the highlight here, making the action even more varied and less straightforward. 0:15 -- A new part layers on top. Those strings from before pick up and take on a new primary melody while the rest remains underneath. The action is accented by ripping hot supersaw stabs -- one of my favorite things in the world to write and play. 0:22 -- These accent notes call on the trailer theme. 0:26 -- The strings get exciting here and move quickly down to meet the rest of the parts as we move into a transition. 0:28 -- I wanted to go nuts with syncopation and alternating synth and bass parts here, so I did. And I wrote a melody that would let that poke through while being fast and moving on its own. 0:40 -- As someone that is very susceptible to feeling tense with high tension music I wrote in a break here. The rhythmic backing continues with a slight alteration but some long notes and slowly opening and closing filters add some calm. 0:49 -- I mentioned drum fills that kind of tumble over into the next phrase and go on too long before. Here's my favorite one. It works well with the syncopation in the synths and bass. 0:53 -- Question-and-answer with some really fast synth parts show up here. A lot of the older gear had slow processors by today's standard. If the tempo is up and is being sent to the synth's clock and it's also receiving lots of fast notes, the old boxes will choke and lose tempo. You can hear that here in the bell and pad parts that are layered with the answer phrases. But I liked how it sounded: messy. 1:05 -- The main theme returns now, but bigger and faster with the addition of pickup notes. Bigger fills and lots of in-between synth fills (tons of 32nd notes) ramp up the action (see 1:13's build). This is a very short piece but it took a long time to track due to these details. 1:29 -- The accented notes serve as a finale and are joined by a variation of the earlier string melody to make it that much more epic and tense. And a very specific airy, searing synth sound I dialed up pokes through. I liked it so much that I had it carry over into the ending and into the loop. Previous version peek! From like 5 minutes into recording this first version I knew it would be rejected. So I wrote a second version (the current boss theme) and delivered them at the same time. I was right. They liked the song but it wasn't right for the game. In this demo you'll hear that it was really pushing toward the piano and fast synth action. I really, really love the funky question-and-answer section starting at 0:38. You can definitely hear my fusion roots here. And the piano solo parts at 0:52 with fast finger action were nice for showing off, but not right for a game about magical fighting. When you dream of writing game music a final boss theme is the kind of song you dream of writing, right? Well, this one was supposed to be fast. And grand and regal. And magical and cosmic and epic. It sounded like a tall order but Contingent99 said they trusted my judgement and that felt good. So I went all-in with the mindset of 'out of this world' for the piece. 0:01 -- Unlike other songs this kicks off with melody and an established underlying rhythmic pattern. But it does hold to the question-and-answer theme that peeks in and out of this soundtrack. Big, wide chords that are really over-voiced answer the string melody and carry the rest of the song. 0:19 -- The unsung heroes of the whole soundtrack, the woodwinds, get some spotlight here in the runs and builds. 0:28 -- This brass fanfare is really too quick to be a fanfare but it works against the string melody and the synths that are bubbling up to carry the action in the main section. 0:34 -- A long synth bass slur up to the fast, funky bass part starts here. I did several takes trying to get it to sound like it fits! 0:35 -- You'd think I'd do a straightforward driving beat for the final boss, right? Nope! I hate those! If you count this -- 1-2-3-4 -- while listening right here it drives movement enough. But on its own it barely stands. And given that the bass part doesn't even sound on the second beat at all -- well, it's weird. But when the melody comes in you can see that Ieft space for those to take over and add to the pattern and fill it out. This comes together in a kind of forward-falling drive that's tense and heroic at the same time. It really sounds like you're up against something! 0:49 -- This descending woodwinds and synth work is exactly why I left space in the rhythm and melody. You start to feel a groove form here, and by 0:58 when the mid brass answers the strings you feel it come together. It's a musical representation of your confidence coming together after fighting against so much. I love that feeling in a boss battle. 0:59 -- We aren't going to forget our bold held chord, are we? 1:02 -- Trumpet and a synth lead double each other here in the start of a new section. But they're not supposed to be the spotlight -- the tom fills are. I wanted the end track to call back to all the ridiculous fills I put into this soundtrack. 1:13 -- Recognize those accent notes? You should! 1-:16 -- There are few things going on here. The piano calls back to the home theme, and the question and answer phrases both point to the intro and the other dungeon themes. 1:33 -- After a big build and pause some calm comes. But with the groove firing on all pistons I wanted it to give a touch of confidence to the listener. I slowly rebuilt the rhythm to go from stumbling to moving to full-on groove. The subtle staccato strings and their simple pattern help feel out the feel. 1:42 -- Remember the supersaw stabs that are ultra filtered and accent a few of the other action songs? They came back too, and on the same duty. And at 1:43 or so you can hear a small, small synth solo. This soundtrack originally had more but we pulled them all and leaned more on the orchestral side. I'm happy with that choice but I left a little memory here. 1:47 -- That weighty bass line from 0:35 was quietly pulled out so I could drop it back in here to amplify the feeling of groove, giving the player a boost in the battle. I was so proud of how this felt that I made a friend come to my studio to hear it in action. 1:55 -- Another holdover from the synth solos I originally had in this track and others. Here they just carry some high end energy and do some transition work. 2:02 -- Our cello friend is back! We couldn't forget him in this big wrap-up. He's joined by a synth wipe and filter closing at 2:06, and then another bass drop-in at 2:08. 2:20 -- And I brought the straight accent notes home here with seven hits, all up against this pretty complex rhythm. And then to seal the deal, with all of the frequency bandwidth I had, I hit the ending with straight accent notes from 2:32 through the ending, as if to call upon all of them in all of the other tracks. At about 2:40 you can hear some super detailed arpeggio work in the synths and I have delays on them that basically carry through to the ending. This game is so hard that I don't know if I'll ever see my ending theme in action for myself. We wanted ceremonial but not necessarily full on regal or celebratory. Just feeling good and kind of at peace is what I went for. 0:01 -- I did this trick throughout the score where I filtered sampled brass, with an opening of the filter coming with the attack. It worked well with the hybrid synth songs but it was an odd choice for a mostly organic song. Still, I used it so that it would feel unique. I like how it sounds here. 0:09 -- I called the solo woodwinds back in to do accent and embellishment, like the descending figure at 0:14 that moves into the next section. 0:20 -- The staccato pattern is supposed to call back some of the others used in the score. Different time signature but the same feel. And I tried to continue the theme of upbeats being accented here as well. 0:31 -- The main theme continues but we have some new answer figures with strong brass here. 0:38 -- A sweet section for some fondness, but it keeps with the slight rhythm play. 0:47 -- A return to fanfare, but with some nods to the magical side of things with harps and woodwind runs. 0:59 -- This second section builds in musical space for you to kind of recall your journey. Solo woodwinds continue to add flair and accents on the second beat keep things lively and continue my theme of avoiding straightforward rhythm. 1:13 -- I wanted to keep the fond feeling here but also pick up the action a bit with some musical representations of magic. And notice our cello friend is back in the background. 1:15 has woodwind runs bringing us into the ending. 1:19 -- And our straight accent figure is back for the real ending! The credits theme is where the composer gets to kick back and do something on his own, right? I wanted to do something fond and warm. Slightly nostalgic, too. I thought it would be a nice contrast against the high action themes of the dungeons and bosses. 0:01 -- Breathing strings and, for once, a straight rhythmic pattern to start things off. But it's in the piano and bells so it's okay. 0:15 -- What's this? Oh, it's our friend Mr. Cello. And he's here for his finale. And what's he playing? OH! It's the main theme -- the home theme. Did you catch that? 0:25 -- Trademark held chord again here. I couldn't resist. But at least it breathes and sounds pretty! 0:32 -- Woodwinds come back again, but for the finale they're finally getting the spotlight! I wish I could be hired to do a game with a full woodwind soundtrack as I love writing for them. Also, sorry about the 2/4 measures I'm randomly adding here in this song. 0:49 -- Piano. This calls back to the home theme both in melody and style. And the breathing string answer phrases were supposed to do the same as well. 0:59 -- You have to do this kind of stuff in an ending theme, right? Listen for the woodwinds going nuts with solos. 1:16 -- And to end it all, cello is back, solo, pulling at the heart and tying it all together with a variation of the home theme. 1:29 -- But I didn't want it to resolve fully. I wanted it to wrap on nostalgia and melancholy over the fondness and warmth. And that big, over-voiced chord gets the last word. These are the first and last songs I wrote for Wizard of Legend. The first one got me the job and the last one finished the job. What's funny is that I never sent them the final music file, so the game's debut, subsequent marketing and social reach, and still today in trailers, is using a demo cut. I kind of cringe when I think about an unfinished piece out there standing for the rest of the game but everyone has become so used to it since I finished it in the middle of 2016 that it stuck. So I included it on this soundtrack unfinished. For the new launch trailer, "Wizard's Wail" revisits that theme in a very fast, action-packed trailer. It was written specifically for the footage and was a nightmare to time specifically to all of the beats and title cards. But it came out well. And it was fun to revisit what kicked it all off. At nearly 200 beats per minute it was too fast to incorporate some of the subtle theme and figure work like I'd normally want to, but there is some in there. 0:01 -- The long chord! I wanted something floaty and shiny to represent magic. I also love the idea of a simple intro like this. 0:15 -- Piano was originally going to carry the themes in my head when I started this project. That didn't last but it was cool here in the debut trailer. 0:51 -- This transition was also supposed to represent magic and give a break to the heavy brass and rhythm. 1:05 -- This is entirely too much concert tom action. There are underlying toms playing accented triplets to drive the action and more on top doing the fills. I had separate submix busses for the different layers of drums so I could mix them so they could all be heard. Contingent99 requested this much tom action! 0:01 -- They vetoed my long, pretty, evolving chord. The WHEERR-bohm is what I did instead and it is kind of cool. 0:02 -- They wanted a big build here so I pulled from the big build I did for the fire theme and mixed it with some of the style set in the original trailer theme. 0:04 -- Again with the super fast woodwinds. I tracked most of the freeform runs and fills in this song at 100 beats per minute and even then they were fast. They lost all detail at this tempo and I kind of liked that effect. 0:06 -- I did a funk bass rip because I was sure I could get away with it. 0:08 -- I wanted this to be breathless and almost a blur so there's almost no detail in the strings or woodwinds. I pick percussive accents to double with like xylophone to accent some of the runs but I mostly wanted them fast and blurry to match with the trailer's fast cuts. 0:14 -- The downward run here kept crashing my sequencer. Probably not worth the trouble in the end but that's kind of the story of most of my musical efforts. 0:20 -- Same story for the down-and-up runs here. But without these here the track loses some motion and it doesn't have that breathless sense. 0:30 -- I don't like those pre-packaged risers that are used in every trailer these days so I spent a lot of time making my own with synthesis and sampling. Even my own voice is in there going hhhheeeeeeeeEEEEEYYY! 0:32 -- I played these flute runs in many times to get them to feel right. 0:44 -- They loved how the debut trailer ended so we worked hard to time it so that the new trailer would end on the same kind of feeling, only amplified. 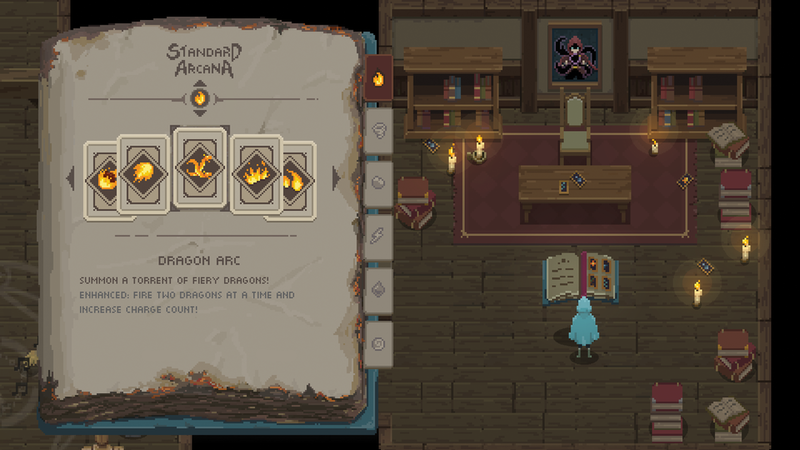 Thank you for taking the time to read about my work on Wizard of Legend. It means a lot to me that someone would take the time to look into my process to get a closer look at my music. I really appreciate it! If you did enjoy the music and haven't purchased it yet, please consider buying my full soundtrack! Same goes for the game itself! If...if there is new work added to the game in the future I'll update this commentary accordingly.